BUYER BEWARE! 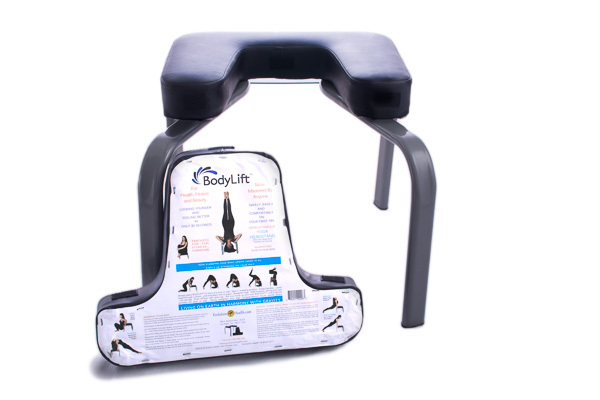 It has come to our attention that there are a several companies selling knock off versions of our Bodylift headstand bench. These companes haven't been in business for long and they are all using the same questionable manufacturer in China, we have tested some of these other copies and they are cheaply made and unstable. Some of the names to watch for are: Aozora, Ranbo, and Balanced Body Headstand and any others that look like ours on amazon, Some of the companies have been using our copyrighted images and our Trademark Bodylift. Our design has been rigourously tested for safety and durability for the past 40 years. Our Bodylift headstand is the first of its kind and invented by Larry Jacobs and used by yoga teachers and studios all over the world. It's a fact of nature... 97% of us turn upside down while in our mother's womb to prepare for our headfirst entry into a world dominated by gravity. Perhaps being upside down now, on occasion, is as natural to our physical well-being on earth as it was when we first made a topsy-turvy appearance on this planet? "The BodyLift created for getting you upside down safely and easily, is the very finest creation to really help people. Thank You very much." The BodyLift yoga headstand inversion tool will turn your life around safely and easily! Today, yoga health and wellness techniques are taught at nearly every health club, spa, and school in America. Indeed, Yoga, an ancient and renown art, is recognized as an outstanding means of helping people to quickly relax and rejuvenate - both mentally and physically. 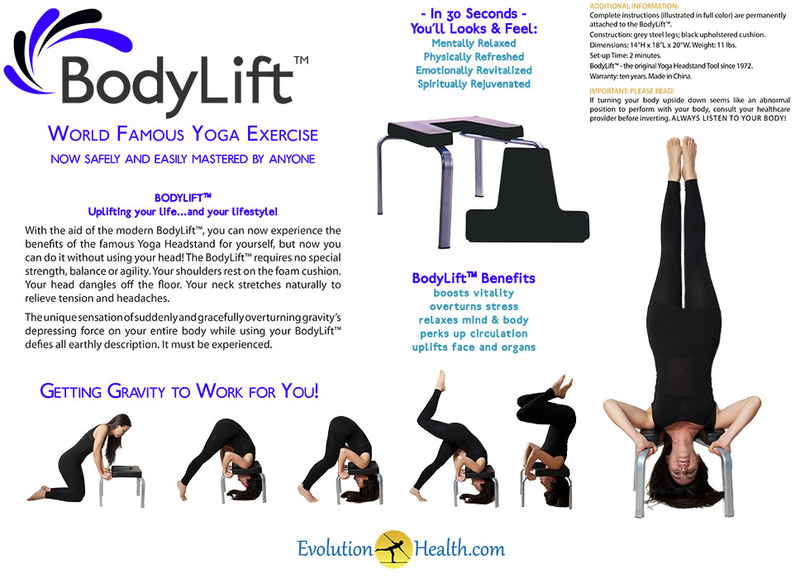 BODYLIFT™ Yoga Headstand: Uplifting your life...and your lifestyle! With the aid of the modern BodyLift yoga headstand prop, you can now experience the lofty benefits of the famous Yoga Headstand for yourself. But now you can do it without using your head! That's because the BodyLift requires no special strength, balance or agility. Your shoulders rest on the foam cushion. Your head dangles off the floor. Your neck stretches naturally to relieve tension and headaches. The unique sensation of suddenly and gracefully overturning gravity's depressing force on your entire body, while using your BodyLift, defies all earthly description. It must be experienced. “Standing on your head with all the weight of your body pressing and compressing your head and your delicate cervical spine, your neck, is one of the most improper and ridiculous things you could ever do with your spacesuit! From my 30 years of MyoFascial Structural Bodywork I can assure you that the headstand practice done conventionally is from a structural bio-mechanical viewpoint one of the most stupid things that you could ever do! Evolution Health and Fitness is proud to be able to bring the Original Bodylift created by Larry Jacobs from Age In Reverse back to the market. We own the exclusive trademark rights to the Bodylift Yoga Headstand. We have kept to Larry Jacob's original design and manufacturing process and maintained the same high quality and safety standards to bring you the very best. We stand by our product 100%. Beware of imitations, trust only the original bodylift trademarked product made by EvolutionHealth.com. The bodylift headstand will help you perform a yoga headstand safely and easily without straining your neck. The beginning yogi may not be strong or flexible enough to do a traditional yoga headstand correctly and end up in a wobbly position attempting to balance the rest of the body onto the fragile neck. This may overstretch or over-compress the neck vertebrae and discs. The bodylift, however, helps support your neck. Your shoulders rest on the foam cushion. Your head dangles off the floor. Your neck stretches naturally to relieve tension and headaches. The increased blood flow to the brain stimulates the pituitary gland which revitalizes the mind and central nervous system. The pose is considered to have a profound effect on anxiety and other nervous disorders which can lead to other illnesses, and is therefore used in the yogic treatment of many conditions. The final position requires muscles in the neck, shoulders, arms, back and abdomen to be active, which strengthens and revitalises the entire body. The inversion changes the effect of gravity on the body, which has an important effect on blood circulation to the legs and head; increases pressure on the diaphragm which aids deep exhalation to expel waste gases and bacteria from the lungs and can relieve the daily effects of gravity on the spine. Includes a 10 year warranty on material & Craftsmanship. 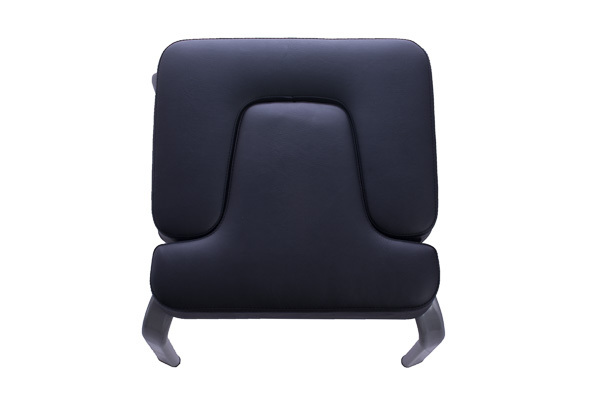 Constructed of oval-shaped (silver) metal legs, and a molded (black) foam cushion. It weights 11 lbs. You can assemble it in two minutes so you can easily take it with you anywhere. The bodylift headstand can support up to 250 lbs. Click on links to see videos. I've always been scared of doing a headstand, I was afraid of hurting my neck. I love that this protects my neck while allowing me to get into the inverted position pretty easily, I can feel my core really working. I'm hooked! Who woulda thunk that such a simple exercise could have such a positive effect on one's health. This body lift makes the maneuver so simple a child could do it - and just doing this a few times a day, I know that I am getting better circulation into my head. I love this thing and make sure I use it regularily. No complains here... thanks for a great product! I ordered the Bodylift a few weeks ago and I am very happy with my purchase! The product arrived quickly and is very sturdy. I have been using it everyday and I am already noticing a difference. My abs feel stronger and I feel my body is more elongated. compressed..as the Chiropractor said..lots of visits,with heat massage to loosen the surrounding muscles just so he could re align my lower back..I couldn't sleep on my bed,stand or sit for long periods without feeling excruciating pain. So bad I would loose feeling in my feet! Aleve is probably the strongest pain medicine I can take..and that stopped working. I woke up every morning miserable-over tired..just exhausted knowing I had another painful day to get through. I couldn't do anything..I was depressed,angry and miserable. My first time using Body Lift Chair shocked me! After just ONE use..just ONE..I slept like a baby! Even through horrendous thunderstorms and downpours! After just one use? Other benefits I have noticed since starting to use Body Lift? My digestion tract is working better, my vision seems better (I don't wear my eye glasses as much) I sleep soundly every night-I wake up refreshed..I am still adjusting to this new &quot;pain-free&quot; feeling..and I will get used to it..My Husband has even started using it..and my daughter likes it too..I absolutely LOVE this Body Lift!!!! Thank You! There was a time when the Bodylift was out of stock for a period of time, I was desperate to have one so I bought a knock sold through another company. The other yoga headstand felt very unstable and I was scared to use it by myself. It had the ability to fold up so you could take it anywhere, but I think that design led to its instability. I am so happy these are back in stock! I have one for home and one for my office. I first saw this on the Martha Stewart show and had to have one. I use it everyday and feel like it gives me a big health boost. I just bought another for my my 60 year old mother, she loves it! i first heard about the Bodylift on the Martha Stewart show a few years back. I bought one and have been using it every day ever since. I'm in 60's and this prop makes the world of difference. I feel more energized, I'm always getting comments that I do not look my age, and the best part is that I look like a skilled acrobrat when I demonstrate it. It looks hard, but it's incredibly easy to use. I follow the recommendation and use a wall, but I can do it without a wall, I just have it set in front of my couch when I do. My abs feel much stronger now. I was first introduced to the Bodylift in an intro to yoga class. I am not coordinated or flexible in the least, this Bodylift made doing a yoga headstand super easy. I started off against the wall, which requires very little skill, and now I can perform the headstand without a wall! My core is getting stronger each time I use the Bodylift. This makes doing a shoulder stand incredibly easy! I started off using it against the wall since I am not a yoga person and the assistance of the seemed like the easiest way to use tlifthe Body. After just a few times on the Bodylift, I could feel the pain in my back let go. Thank you for making such a useful product!